The Short Belfast is a heavy lift turboprop freighter built by Short Brothers at Belfast. Only 10 were built for the British Royal Air Force with the designation Short Belfast C.1. When they were retired by the RAF, five went into civilian service with the cargo airline HeavyLift Cargo Airlines. Two aircraft still exist, one is on display at the RAF Museum Cosford. The Belfast was notable for being only the second aircraft type to be built equipped with autoland blind landing equipment. To meet the demands of the specification the Belfast used a high wing carrying four Rolls-Royce Tyne turboprops. The cargo deck, 64 ft long (20 m) in a fuselage over 18 ft in diameter (5.5 m) (roomy enough for two single-deck buses), was reached through a "beaver tail" with rear loading doors and integral ramp. The main undercarriage was two 8-wheel bogies and a 2-wheel nose. The Belfast was capable of a maximum takeoff weight (MTOW) of over 220,500 lb (100 tonnes) - less than the contemporaneous 250-tonne Antonov An-22 and the 128-tonne Douglas C-133 Cargomaster, but more than the C-130 Hercules. It could carry 150 troops with full equipment, or a Chieftain tank or two Westland Wessex helicopters or six Westland Scout helicopters. The original RAF requirement had foreseen a fleet of 30 aircraft, but this number was to be significantly curtailed as a result of the Sterling Crisis of 1965. The United Kingdom government needed to gain support for its loan application to the IMF, which the United States provided. However, one of the alleged clauses for this support was that the RAF purchase Lockheed C-130 Hercules aircraft. With a surplus of airlifting capacity the original order was reduced to 10. The Belfast entered service with No. 53 Squadron RAF in January 1966 based at RAF Fairford. By May the following year they had been moved to RAF Brize Norton. Following entry to RAF service it became apparent that a major drag problem was preventing the initial five aircraft attaining Short’s desired performance. Suction drag on the tail and rear fuselage was so severe that the RAF personnel gave the aircraft the nicknames "‘The Dragmaster", "Slug" and "Belslow". Modifications and testing were carried out, particularly on aircraft SH1818 (which was at the time perfecting the RAF’s requirement for CAT 3 automated landings at RAE Bedford) and a new rear fairing was built improving the fleet’s cruising speed by 40 mph. Picture - The Belfast is quite a large aircraft, as can be seen in this photo when it is compared to the vehicles and personnel near it. The reorganisation of the new RAF Strike Command was to have repercussions of the RAF’s Belfast fleet and ushered in the retirement of a number of aircraft types including the Bristol Britannia and De Havilland Comet in 1975. By the end of 1976 the Belfast fleet had been retired and flown to RAF Kemble for storage. TAC HeavyLift then purchased five of them for commercial use in 1977 and operated three of them from 1980 after they had received work so they could be certificated to civil standards. Ironically, some of them were later chartered during the Falklands war, with some sources suggesting that this cost more than keeping all the aircraft in RAF service until the 1990s. 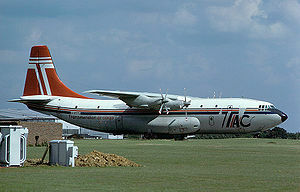 After being retired from TAC HeavyLift service several were parked at Southend Airport for a number of years until one aircraft was refurbished and flown to Australia in 2003. This aircraft is still flying (as of January 2010) in Australia for HeavyLift Cargo Airlines; it is often visible parked on the General Aviation side of Cairns International Airport in Queensland, in company with one or two of the company's Boeing 727s. Now registered RP-C8020 it is currently (November 2010) sitting on the Cairns International apron to where it was moved prior to the scrapping of the remaining company Boeing 727 (RP-C8016), in Cairns, at the end of September 2010. It is understood that RP-C8020 cannot be started and could possibly be a candidate for the second scrapping of a HeavyLift aircraft in Cairns. A second, G-BEPS (SH1822), was to have joined her in Australia following refurbishment at Southend Airport but was scrapped in October 2008. The last production Belfast (Enceladus, XR371) is preserved at the RAF Museum Cosford. Recently this aircraft has had a repaint before being preserved undercover at the National Cold War Exhibition. Hewson, Robert, ed. Commercial Aircraft and Airliners. London: Aerospace Publishing Ltd. and Airlife Publishing Ltd., 2nd ed, 2001. ISBN 1-84037-064-5. White, Molly O'Loughlin. Belfast : The Story of Short's Big Lifter. Hinckley, UK: Midland Counties Publications, 1984. ISBN 0-904597-52-0.